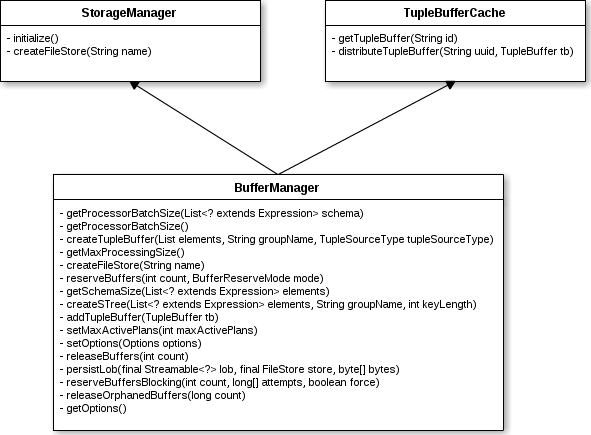 As below figure, the Key Interface of Teiid BufferManager is BufferManager, it extends of interface StorageManager and TupleBufferCache. The buffer manager controls how memory is used and how data flows through the system. It uses StorageManager to retrieve data, store data, and transfer data. The buffer manager has algorithms that tell it when and how to store data. The buffer manager should also be aware of memory management issues. A Tuple in Teiid is equivalent to a list data structure, TupleBuffer has the ‘addTuple()’ method, that means add a list data. The data type in list be defined with ElementSymbol list, we will show this in example in example section. TupleBuffer also has addTupleBatch() method, it used to add a list of Tuple, we will show this in example section. The example below show how use TupleBuffer add Tuple and iterator data via TupleSource. 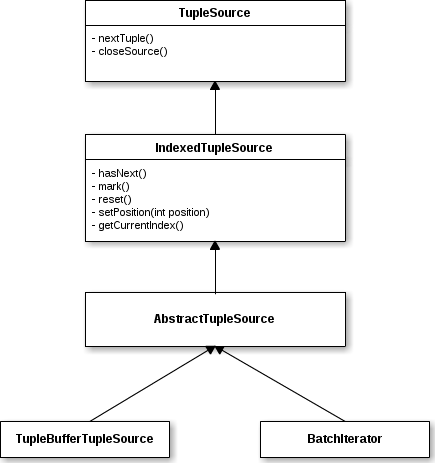 The same as Example.1 TupleBuffer with Tuple and TupleSource scenarios, this example show how use TupleBuffer add TupleBatch and iterator data via TupleSource. Run above code will output the same result as Example.1. The same as Example.1 TupleBuffer with Tuple and TupleSource scenarios, This example will create a TupleBatch, set the TupleBatch’s attributes. The STree is a Self balancing Search Tree. More details from STree please refer to Wikipedia. The Data Structure same as Example.1 TupleBuffer with Tuple and TupleSource’s scenarios, this example show how STree insert. BatchManager acts as a combination serializer/cachemanager. It also related with a TupleBuffer. Teiid BufferManager use LRFU Eviction Queue in Cache Eviction, which LRFU means Least Recently Used (LRU) and Least-Frequently Used (LFU), both of them are common Cache algorithms, more details from Wikipedia. BufferFrontedFileStoreCache - Implements storage against a FileStore abstraction using a fronting memory buffer with a filesystem paradigm. All objects must go through the memory (typically off-heap) buffer so that they can be put into their appropriately sized storage bucket. SplittableStorageManager - A storage manager that combines smaller files into a larger logical file. The buffer methods assume that buffers cannot go beyond single file boundaries. FileStorageManager - Implements file storage that automatically splits large files and limits the number of open files. EncryptedStorageManager - Implements a block AES cipher over a regular filestore. NOTE: BufferManager’s default implementation use SplittableFileStore.